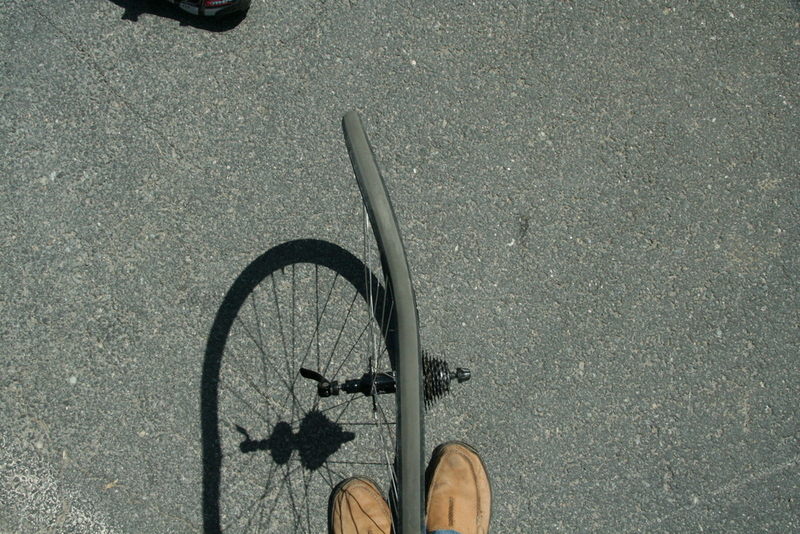 Saturday’s Boone Roubaix, which pays homage to cycling’s toughest monument, was an absolute blast. It was completely and utterly ridiculous, legitimately crazy, and hard enough to make the hardmen suffer. I enjoy this kind of absurdity in a masochistic-tell-your-friends-how-stupid-you-are kind of way. Here’s the rundown: Each race took riders through a combination of grueling climbs, heinous gravel, and gruelingly-heinous gravel climbs. Races varied in length between 18 and 69 miles. It would seem that in an average field, approximately half of the starters either flatted, got lost, gave up, or combined all three. I managed to mostly avoid these problems (more on that later), which more or less ensured a strong finish. The Men’s C race started slow. It was so slow that there was a crash within the first few miles due to excessive braking. The field stayed together over the first climb and descent and through the first flat gravel section. As soon as we reached the base of the first gravel climb, all hell broke loose. As is typical for me, I started in a terrible position near the back of the field. Two Navy riders attacked hard at the front, and the chase was on. I passed most of the field in the lower gravel section of the climb, and by the time I made the turn onto pavement (still uphill), I was sitting in sixth. I could see the lead police car followed by two Navy riders, a gap, and four App State riders chasing. I knew I had to catch that group to have any chance at winning. I started closing the gap, but I couldn’t quite bridge. As soon as the road turned downhill it was all over. I watched all six riders disappear and spent the next several miles soloing in no man’s land. I was chasing solo when I made the first of what would become three wrong turns in the race. The turn was unmarked, and there was no one at the corner to direct me. Great. Just after that turn, Mark from Duke and Harris from NC State caught me, and we worked together for a few miles. The course continued to take its toll, and on the second gravel climb, I once again found myself alone. Not long after, I was joined by a group of six that stayed together to the finish. We worked well together, but were once again flummoxed by unmarked turns. We took two wrong turns in a period of about ten minutes, which pretty well ended any hope of catching the leaders. We were racing for sixth. As soon as we left the final gravel section, I started attacking. It didn’t work. I hit the gas out of the last corner and started a 500m sprint that ended up being a perfect leadout for Alex from Duke. He had me by a bike length at the line, but I held on for seventh overall. I’m pleased with my result, but I can’t stop thinking about the ones that got away……next time. For those of you who missed yesterday’s video update, let me say that my day ended rather spectacularly. Summary: I was sitting last wheel for most of the race. I felt good. I made a move from last wheel to third wheel over the course of half a lap. I clipped my pedal on a turn and crashed like an idiot. A Navy rider crashed into me (not his fault), while the rest of the field somehow avoided us. He got up and finished; I sat on the ground like a sissy. 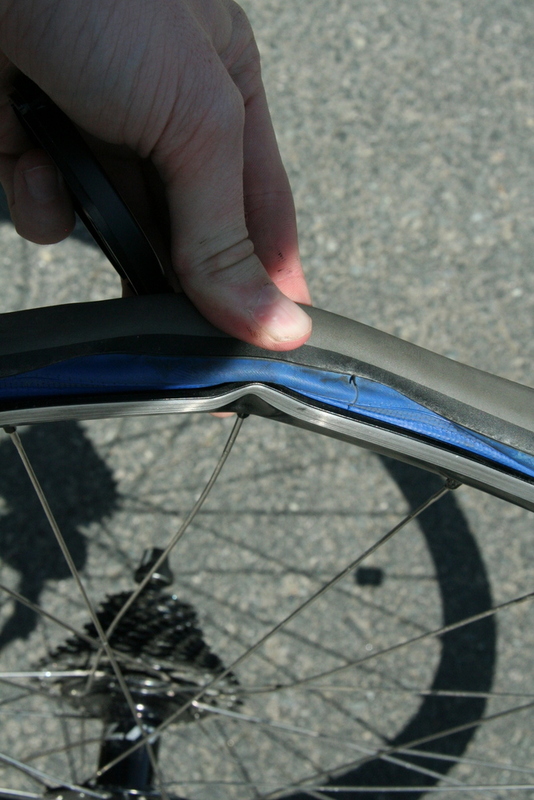 I was fine, but my rear rim and derailleur hanger were destroyed. I now have a video to remember this day forever. Great. The weekend was a big success for the Hokies. Reid Beloni took the team’s first victory of the season in emphatic solo style on Saturday’s 69-mile suffer-fest. In the B field, Matt Dockins took second as the only Tech finisher out of six starters. Sunday’s crit saw Freshman Jacob Aber win the B race by a half-wheel over Mike Breitenbach. Matt Dockins, who powered the Big Orange Train for most of the race finished fourth, just shy of an all-VT podium. Reid managed to recover for the crit and finished strong to take third in the A race. Despite the rampant flats, unmarked turns, sketchy gravel, occasional hitch-hiking, crashing, and general chaos, this weekend was a success. I know it was painful, but it was never dull – and that’s what keeps us coming back for more. How’s that for a silver lining?